I spent an interesting fifteen minutes over at the Portland Pudgy stand. 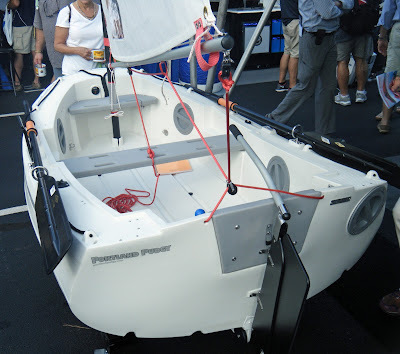 The Portland Pudgy is a another variation on the dinghy tender; this one in rotomolded plastic, with an emphasis on dual use as a life-boat if disaster struck. After looking the Portland Pudgy over, one comes away with the impression of a different take on the cruising dinghy; well designed, not too expensive, commodious despite the short length, and buoyant enough to work out as a life boat if needed. All of my time spent at the stand was in talking with Pam, the wife of the designer, David Hulbert. We mostly discussed the travails of running a Mom and Pop boat production business, particularly how little things can gum production up. The sub-contractor that made the specialty designed inspection ports for the Portland Pudgy went bankrupt, unbeknownst to the Pudgy production team. When they went over to subcontractor's shop, they found it shuttered up with the specialty tooling for the inspection ports locked inside. Once they got it all sorted with a new subcontractor there was a three month hiatus on getting Pudgy's out the door. I detected an undertone in her story of maybe this was too much, too all consuming, particularly for a couple in their senior years. But the Portland Pudgy does offer something unique in the boating world and there appears to be a steady market going forward. The FAQ page on the Portland Pudgy as a straight up dinghy. The FAQ page on the Portland Pudgy sailing rig. Editors Note: This is a repost from George A's Mid-Atlantic Musings article about new Mothboat builds. Jamey Rabbit is building a modified Mistral. 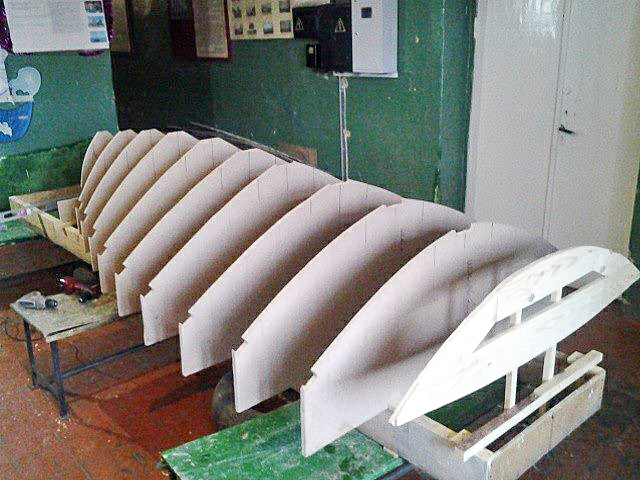 Bill Boyle is at it again, building a new Europe Dinghy in wood strip construction. This is a sketch of one of the large sandbaggers, used in an ad for Geo. W. Carpenter, Sailmaker, appearing in an 1894 issue of Forest and Stream. 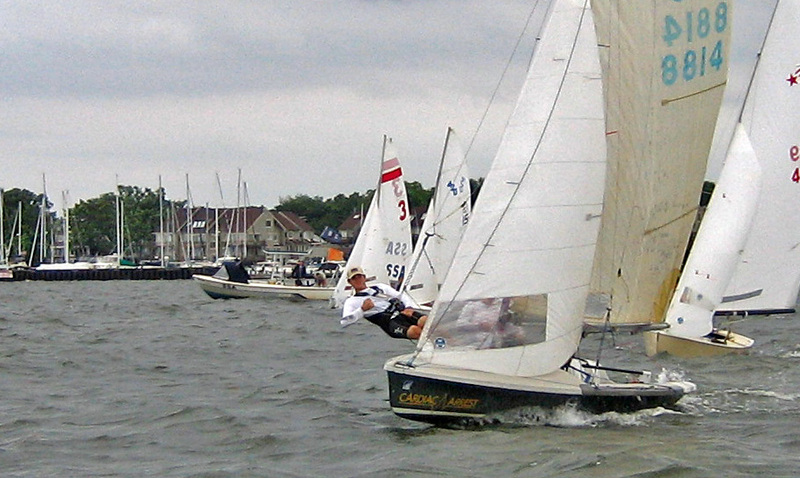 From the Earwigoagin archives; my experience with sandbagger sailing. We had a bit of snow and wind over the weekend here in the Mid Atlantic. Damned inconvenient in the modern world... waiting, ... waiting... house-bound, but the snow plow did finally come through today to free us up. To overcome the ennui of isolation what better than to view a video where life is balmy, even tropical. Ah! shorts, bare feet! A video of a twilight sail in a traditional day charter boat our of St. John, U.S. Virgin Islands. Sailing in St. John, US Virgin Islands from angelo on Vimeo. Many knowledgeable pundits, especially those from the Antipodean region, consider the two man 12-foot skiff the most difficult dinghy to sail. I, never having seen one, will concur readily after seeing this video. 4th rig refers to the smallest racing rig for the heaviest air. The 12-foot skiff allows different rigs to be switched in and out depending on the wind strength. The previous header photo was of a Bermuda Fitted Dinghy on her side. This is the second time I have put the Bermuda Fitted Dinghy up as a header photo. Even though I consider the Bermuda Fitted Dinghy the most photogenic of all dinghy classes, it is obvious that this photo doesn't do justice to the sweet sheer, rounded lines and huge rig of the Fitted Dinghy. But the possibility of capsize is always lurking for the inattentive or for those who sail extremely over-canvassed dinghies, as is the case here. Just part of the fun and this blog takes a perverse delight (since the blogmeister has certainly spent his fair share swimming alongside a dinghy) in featuring photos of capsizes. Here is a quadcopter video by Andrew Stevenson of the Bermuda Fitted Dinghies racing. (Light winds so no drama.) I can't embed it but you can follow this link to view the video. Foils, foils and more foils. 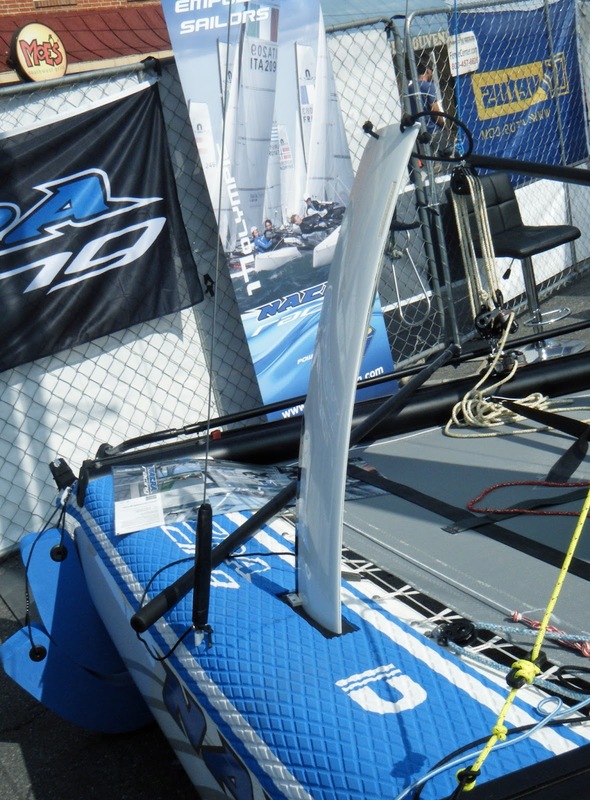 Foils were the centerpiece of attention for two very interesting small catamarans on display at the 2015 Annapolis Sailboat Show. 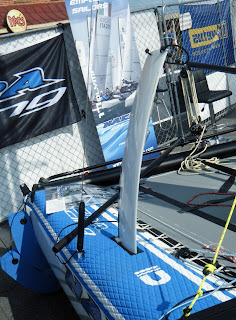 The Nacra 15 junior catamaran was the first cat that I stumbled upon as I wandered the show, sitting next to the Melges 14. It had all the bells and whistles of the modern cat, double trapeze, square-top rig, assymetric spinnaker with tube launcher though what stood out were some nifty foils usually not seen on a production catamaran. The problem with the high aspect, tall rigs of the modern cats is that, when married to a short hull, they pitchpole spectacularly. To work around this problem the designers of the Nacra 15 have fitted curved daggerboards and anti-diving winglets on the rudder. The curved daggerboard provides upward lift when fully down. This unweights the leeward hull and keeps the bow out. 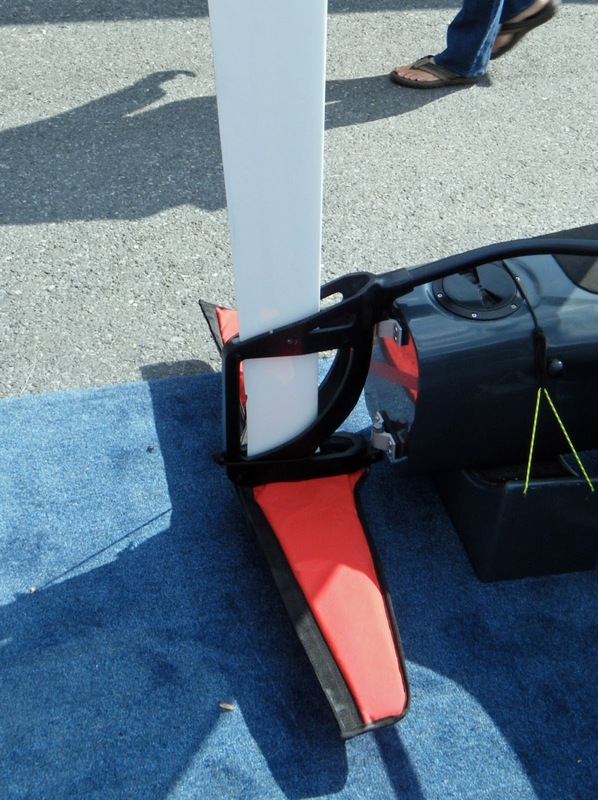 The anti-diving winglets on the rudder take over when the pitch angle starts to go negative, applying force to hold the stern down. Despite just a couple of production prototypes sailing in the fall of 2015 the Nacra 15 impressed ISAF enough to be named their official junior catamaran in December, 2015. 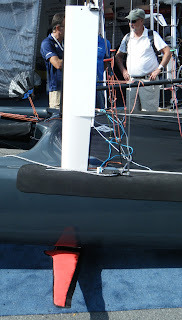 If I was marketing director over at Nacra I wouldn't keep this platform only for junior sailing. What about offering a second, smaller rig with only a single trapeze and making a detuned Nacra 15 class targeted for couples? 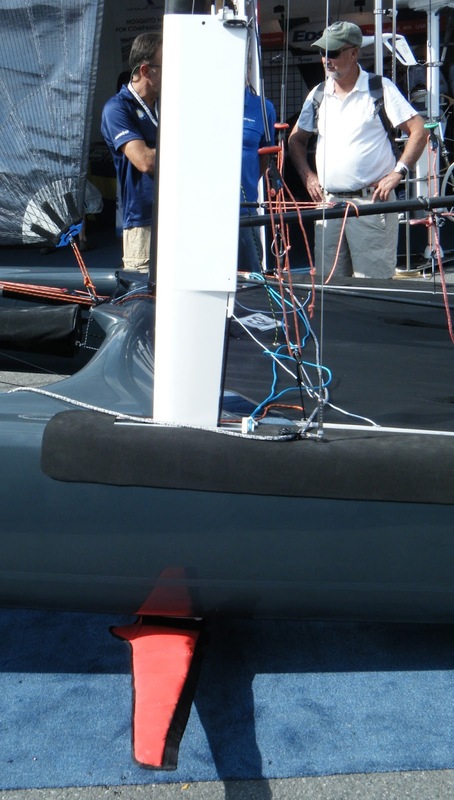 More about the Nacra 15 here. In this photo is one of the curved daggerboards. Also the entire deck between the beams is covered in SUP anti-slip foam. Promotional video of the Nacra 15 at speed. The second catamaran to catch the eye was the spectacular, all carbon, foiling 5.4 meter/17.7 feet Whisper from England. The platform weighs just 78 kg. The moldings and fine detail work was exquisite. 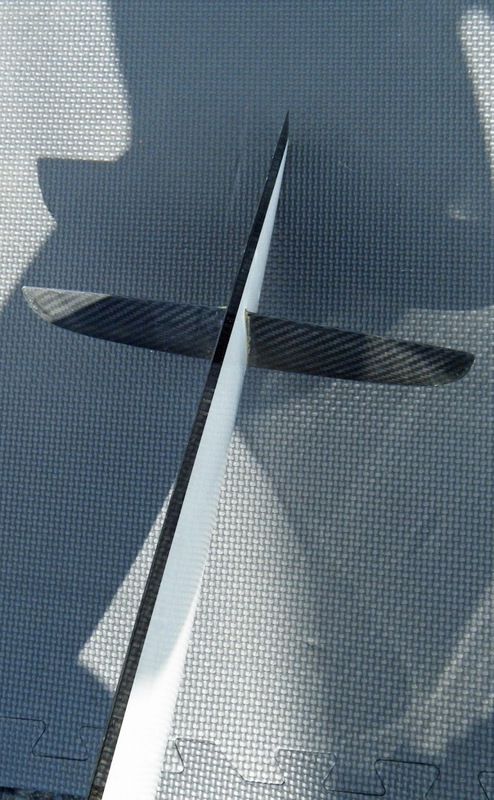 The foils are typical to what is used on the International Moth, T-foils up forward, controlled by a wand, and a T-foil on the rudder. I didn't hang around long enough to get an explanation on how it is all adjusted but I did have a short conversation with Robb White, the builder. He said the foils were designed for early lift-off (more area), and not ultimate speed. Only $30,000 USD if you have a burning desire to be the fastest one on the river (and if you have the time and crew to learn how to sail her). More info on Whisper by clicking here. 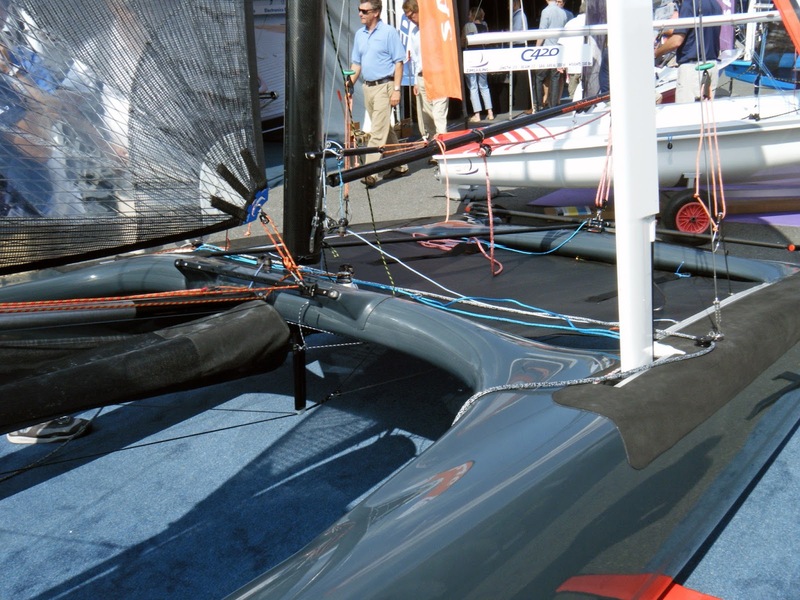 Yachting World's Matthew Sheehan put out this video on his sail test of the Whisper foiling cat. At the end of the video, Matthew, like many in the media, feel that foiling will take over the sport. I, on the other hand, feel foiling will always remain an enthusiasts niche - not one for the general sailing population. Music Whenever; The Speakeasies Swing Band "Theme from Godfather"
The Star Wars movie series is fun - at least the recent one matches the first three in touching all the buttons - but, let's be honest, still sci-fi fluff. But the Godfather, the Dark Side not as a caricature, but the Dark Side we can relate too, the one that is embedded into our brain as the true dichotomy, the statement of the paradox of the human animal. A great cover of the Godfather theme, the wistful, tender, but ultimately boppy love song (lyrics by Larry Kusik, and music by Nino Rota) underpinning a movie about the battle of the black souls, call them anti-heroes, but seared into our culture nonetheless.. I wandered over to my old sailing club, Severn Sailing Association, on Sunday and ran into Ali Meller, just in from Laser frostbiting. 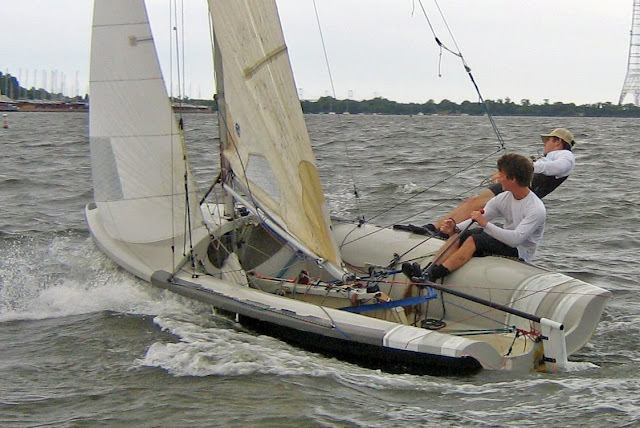 Ali is a long time 505 racer and I was interested in finding out how preparations are going for Annapolis to host the 505 Worlds in September, 2017. The 505 fleet at SSA is relatively small, ten boats or so, and to take on such a high-profile regatta as the 505 Worlds must be a daunting task for such a small group. To pull this one off, the 505 fleet has gone out to the Annapolis sailing community. Two yacht clubs are sharing the responsibility in running the event, SSA and Eastport Yacht Club and the RC is being recruited from the best of Annapolis. Given the strength of the dollar Ali expects the Worlds fleet to be around one-hundred, which, for North America, is huge numbers for a two man high performance dinghy. Below is a great 505 promotional video shot by Chris Love, who does all of the Intercollegiate sailing reporting in the U.S. Although the 505 aficionados interviewed in this video downplay the intensity of the class, make no mistake; to race at the top level in the 505 is just below the commitment of an Olympic campaign. A true fanatics performance class. International 505 Promotional Video from Chris Love on Vimeo. Two photos of the 505 from the Earwigoagin archives; these taken at a SSA's Tuesday night series a couple of years ago. For those who have dug back in Earwigoagin, you may have come across the fact that the blogmeister raced Internatonal 14's back in the 1970's and early 1980's. The International 14 of those years was very similar to the 505, single trapeze, big symmetrical kite. The modern International 14 has developed into a skiff but I occasionally wonder what the International 14 would look like today if it stuck with the rig of the 1980's - probably very similar to the current 505. A photo of the Canadian Harvey brothers ripping it, I think in 1980 (just had to sneak this in). "The racing season was mixed. I had very high expectations and Pinky Too was finished and polished very well. Unfortunately I didn’t take into account the difference in weight relative to the standing rigging. This led to an entire season of tuning and adjusting. Adding to the frustration was Pinky Too’s performance during certain points of sail. She was untouchable at times but I could not point with the rest of the fleet. As a result the races were filled with both hope and despair. I’m also a little rusty….. It is heartwarming to see a new one of these pre-1900 designs hit the water. 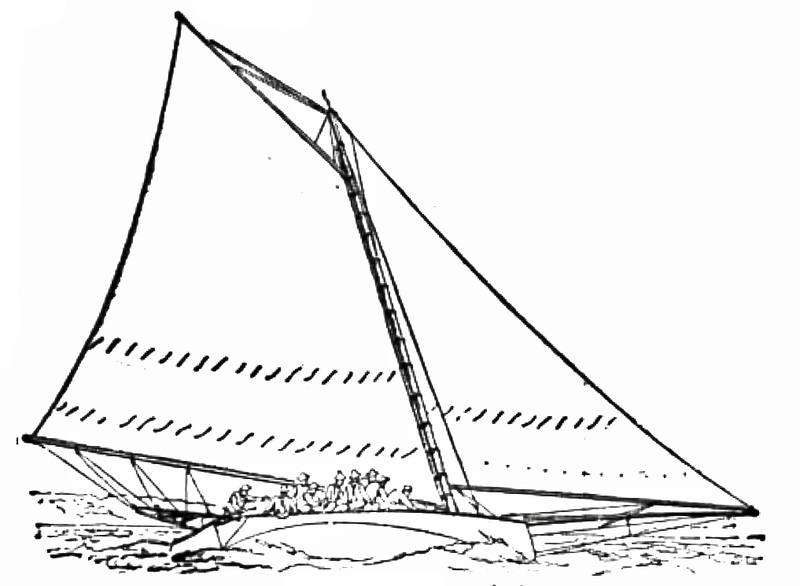 The history of the Lark Scow. Not sure where this is - maybe one of the Net denizens reading this post can enlighten me - but this video has charm; a seaside row of cottages, repairing a dilapidated sailing dinghy next to a busy pedestrian path, rigging up and then kicking around on a protected bay. The class of dinghy is also a mystery. She looks short, maybe 2.4 meters, with an overhanging boom and a masthead jib - who knows if this is the original rig or something glommed onto the hull? And the name? What is, or who is Gugh? "Looks like Christchurch, the row of beach huts by Hengisbury Head. Sailing is inside Christchurch harbour and you can see view of the open sea in Christchurch Bay with the Isle of Wight in the distance. More about Christchurch from Max's blog. 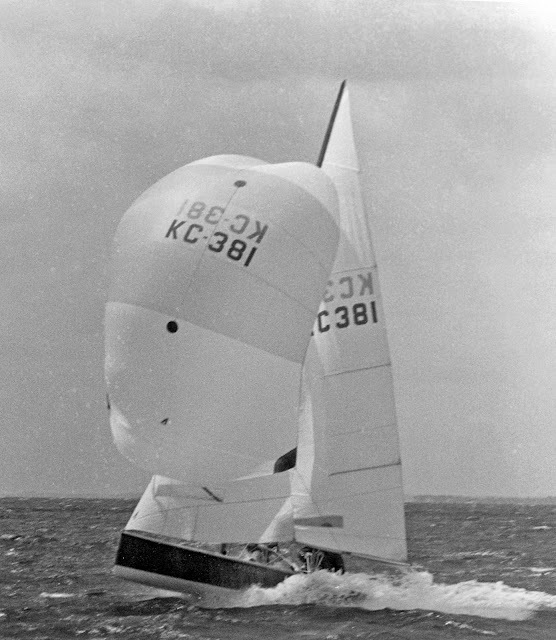 Patrick Hay chimes in with a comment and correctly identifies the dinghy as the Bobbin class, length 2.7 meters, beam 1.27 meters, manufactured by Pearson Brothers of England in the 1970's. More information on the Bobbin can be found over here. All in all, a very nice piece of both quadcopter and land-based videography. A Short Film About Gugh from Sam Swift on Vimeo. Sutton Manor, New Rochelle - "America's Sailing Community"
My hometown, Annapolis, has the slogan "America's Sailing Capital" whereas Newport, Rhode Island, long-time home of the America's Cup, about 640 km (400 miles) north of Annapolis, goes one better with their slogan "The Sailing Capital of the World". Notwithstanding the competing Chamber of Commerce hype of these two East Coast sailing towns, there is one community that, between the war years of WWI and WWII, could rightly maintain they were America's Sailing Community. Howard McMichael, winner of championships in the 210 Class, the International One-Design and Hipkins Trophy. Walter Coursen, a Commodore of the Larchmont Yacht Club and the New Rochelle Yacht Club. Also, two prominent sailors featured in the Earwigoagin historical archives; Larry Huntington and Harry Hall, owned houses in Sutton Manor. To take a stroll through Sutton Manor during the 1920's and 1930's, one could, every couple of hundred steps or so, have a very interesting conversation about boats and sailing. From a Russian forum thread on the Classic Moth (whew! Google does a horrific job of translating Russian to English) comes a photo of forms set up to do a Mistral build. "The Moth is being built in Moscow region by Serg-IF(nickname on boat forum) according to your boat plans. It is planned that Moth will strike the water of Oka-river this spring. As for me I plan to build my Moth this spring. Hope that I'll have enough time for that. Also there is one more guy from Tsimlyansk (it is on Don river) who interested in your Mistral. It could be he will start building. He have a huge experience in boatbuilding and sailing. Music Whenever: St. Paul and the Broken Bones "The River Song"
Nope! Not Otis Redding. Just some white dude and his white band and they just nail this blues song in a real bender of sterotypes.